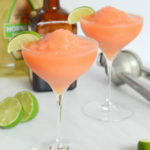 Or as those of you who love cocktails as much as I do may call it, Cinco de Drinko! I am beyond stoked to bring you today’s cocktail because (a) it is only the second frozen cocktail I’ve ever posted on the blog (second only to this delicious Frozen Cantaloupe White Wine Sangria, which would also be perfectly fitting for this occasion) and (b) it is the ultimate spring-summer hybrid, so perfect for this time of year! 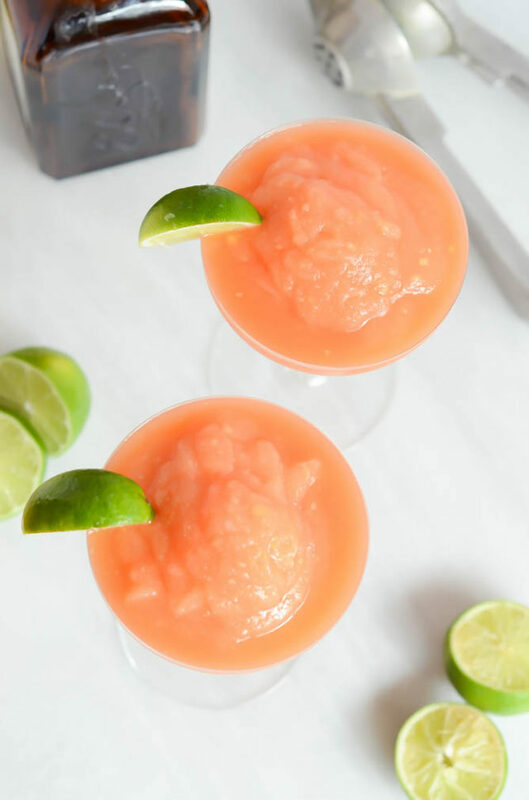 Yes, this Frozen Watermelon Peach Margarita I’m sharing with you today is so refreshing and tasty, you’re going to have to seriously pace yourself because you’re just going to want to be drinking these non-stop today and all through the weekend. Unfortunately, seeing as I’m busy learning and hobnobbing with the big names at the Everything Food Conference in SLC today, I won’t be able to enjoy any of these for this festive holiday, but I’m sure I’ll be able to find some way to celebrate, and there will be plenty of time to enjoy a Frozen Watermelon Peach Margarita down the road as the weather gets even warmer in sunny California! And since I won’t be making my normal rounds to all of the Mexican restaurants/bars with the hubs and his work crew this year, I’m dying to live vicariously through all of you. Tell me, what fun things are you up to today to celebrate? I’ll probably even be jealous if your plans amount to no more than making huge vats of Kimchi Bacon Guacamole and Spicy Homemade Salsa (and maybe some Frozen Watermelon Peach Margaritas?) and enjoying them in front of the TV in the comfort of your own home. Ain’t no shame in that game and you’ll probably find me doing the same once I’m done with the conference for the day. 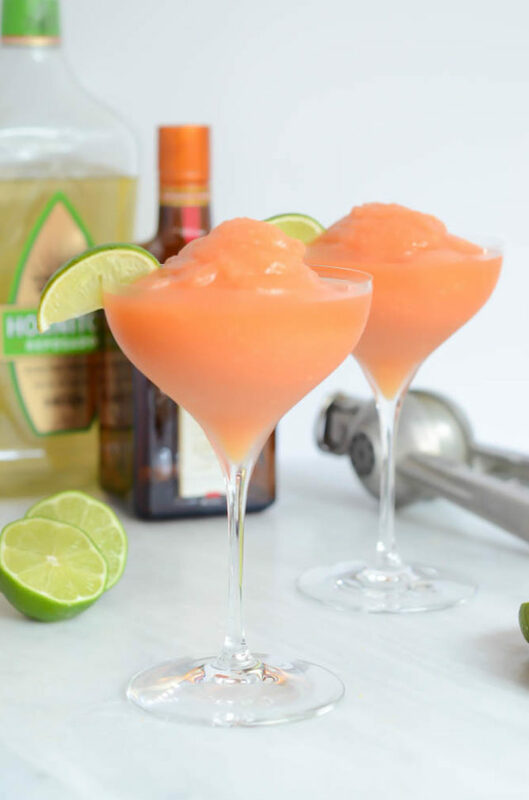 So, about this Frozen Watermelon Peach Margarita, there’s really nothing genius about it, just a whole lot of really fantastic flavor. Now, I’m not one for frozen drinks that are made “frozen” by a heavy scoop of ice, as I find this just makes them incredibly watered down as they melt. Instead, I prefer to freeze my fruit (or any other solid ingredients you’ll be using) so it both makes the cocktail icy but also imparts a whole lot of flavor whether you drink it all right away or want to nurse it a bit (which is always a good idea with tequila!) That being said, I froze both the watermelon (seedless, mind you) and peaches before adding them to the blender with all of the other ingredients. And speaking of “all the other ingredients,” we’re talking the classics that you see in just about every margarita recipe. So tequila, Cointreau and lime juice. Like I said, nothing fancy! I want to keep this as easy as possible for you so you have no excuse to whip some of these up because they are sooooooo tasty. 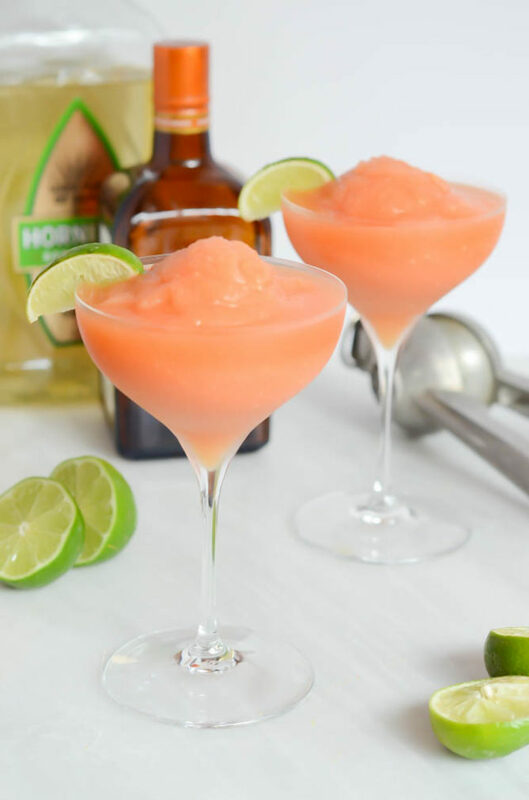 Throw all of the ingredients in a blender and pour into frosty margarita glasses. Maybe garnish with a lime wheel and/or give those glasses a salt rim if you’re feeling fancy (or need some sodium in your life…haha!) No judgment here. These recipes are for YOU. 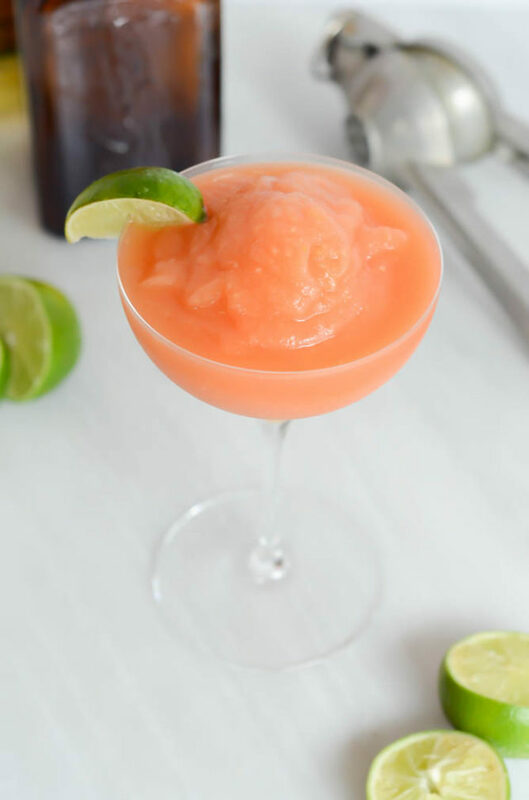 This fun frozen cocktail is the perfect spring-summer hybrid, with both watermelon and peach amping up your everyday margarita flavors. If you like your margaritas with salt, rim two chilled margarita glasses with lime juice and salt before preparing the cocktails. Combine all ingredients in a blender and puree until smooth. Pour into two chilled margarita glasses, whether with salt or without. Garnish with a lime wheel, if desired.